Garden City, N.Y. – At 9:00 a.m. on Saturday, February 8th, 2014, in cooperation with the Rube Goldberg Machine Contest and Rube Goldberg, Inc; The Cradle of Aviation Museum will host their fourth Annual Regional Rube Goldberg Machine Contest for high school and middle school students to transform everyday materials into wacky innovative machines that take 20 or more steps to accomplish. This year's task - "Zip a Zipper." 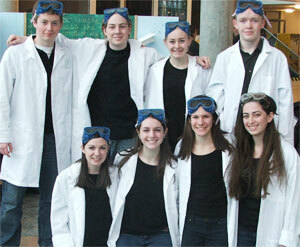 Students from Long Island, Rockland County and even New Jersey will compete this year. The ingenious inventions provide a learning adventure for high and middle school students to explore engineering and technology in a fun and exciting manner. The only limits on creativity are the students’ imaginations. High School teams that win at the regional level will be able to compete at the national level to be hosted by Waukesha County Technical College in Wisconsin. The winning teams have appeared on Late Show with David Letterman, ABC’s Jimmy Kimmel Live!, NBC’s Today Show, CBS’s This Morning, The CBS Evening News, CNN, Good Morning America, Newton’s Apple and The History Channel. The Rube Goldberg Machine Contest will be held from 9:00am -12:00pm. The Cradle of Aviation Museum is located on Museum Row in Garden City, New York and is home to one of the world’s most diverse and outstanding aerospace collections. The museum serves over 250,000 visitors each year providing a “wow” experience as they travel through time seeing over 75 air and space craft; from hot air balloons to jet aircraft and an actual lunar module!